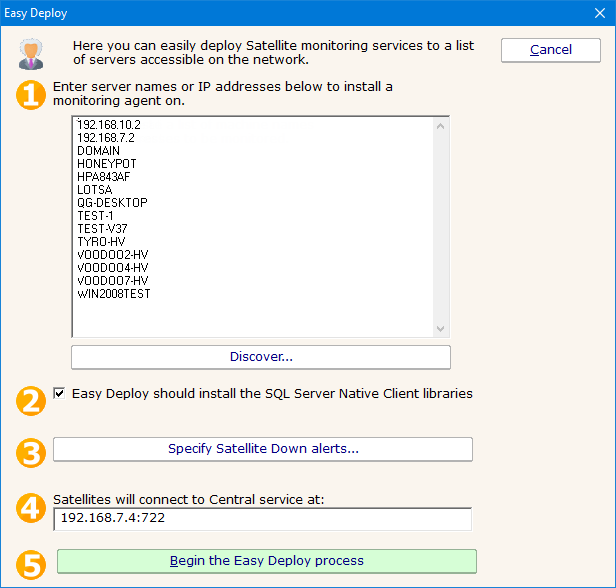 Easy Deploy is meant to help push out Satellite Monitoring Service software to servers that should be monitored. When Satellites are not connecting to the Central Monitoring Service, you can receive an optional alert. This button controls that. It can be changed later on an individual Satellite basis, or many can be changed at once via Bulk Config. The Satellites have to know the server name and port to connect to the Central Monitoring Service. The default value will work in most circumstances, but if a different machine name (perhaps an IP address) needs to be used, you can change this here. Once the value is sent out, you can change it on each individual Satellite if needed. Begin! When the process starts, you will be taken to a report that updates every 30 seconds showing the progress being made. PA File Sight's Setup.exe (copied from the product's Install folder) is sent to the remote server via an administrator share. PA File Sight's Setup.exe program is launched via RemCom, an open source package similar to Microsoft's PsExec program. Setup.exe will run silently installing the Satellite component on the target server. Setup is instructed to never reboot the computer. The Satellite service will be started and told to connect to the Central Monitoring Service using the server name and port specified above. The Satellite will connect, and the Easy Deploy process will automatically accept it, and then add a computer (the Satellite itself) to be monitored by the Satellite. At this point, you can add monitors to the target servers.